How many mini cupcakes can you fit on a plate? 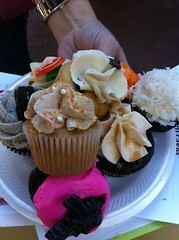 How many mini cupcakes can you fit on a plate?, a photo by Rachel from Cupcakes Take the Cake on Flickr. Ha! That's my plate! Unfortunately two took a nose dive off the plate before I could eat them. Great to meet you Rachel!